Police are appealing for witnesses after three men broke into a house and claimed to be looking for someone in the back garden. 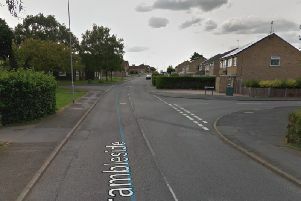 A couple were in the sitting room of their bungalow in Dunkirk Avenue, Desborough, at about 9.30pm on Monday (May 15) when they heard two loud bangs at the front of the property. A spokesman for Northants Police said: “The husband went to investigate and found two men wearing black clothing in the hallway who said they were looking for someone who had gone into the back garden. “He asked them to leave, they left through the front door and one of them called: “Let’s go Steve” at the other. “A third man, who had been in the kitchen area, also left. “They appear to have entered the property through the front bedroom window. The first offender is described as a slim, 5ft 11in white man in his mid 20s, and he wore a black cap with a head torch on, black jacket with dark trousers and a scarf over his face. The second is described as a slim, 5ft 10in white man in his late teens or early 20s, and he also wore a black cap with a head torch, black jacket, dark trousers and a scarf over his face. The third offender is described as a stocky, 6ft white man who wore a black cap, black jacket, black T-shirt with white lettering, dark trousers and a scarf over his face. Anyone with information or any witnesses can contact police on 101 or Crimestoppers anonymously on 0800 555111.